Please feel free to contact me if you need any additional information or if I may be of service to you. 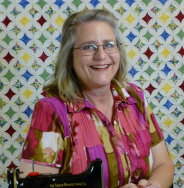 I am passionate about sharing our rich quilting heritage with audiences and students. Please contact me to schedule a program or workshop. I check my email regularly. So, if you don't hear from me, something is lost in cyberspace. Try typing my address into your regular email, or feel free to call. If you call, please keep in mind that Nova is in the Central Time Zone. ATTENTION: It has come to my attention that my phone messages are not always coming through. I always return phone calls and answer emails. So, if you do not hear from me, please try again. Though Nova Montgomery specializes in the Singer Featherweight, she is not affiliated with the Singer Corporation in any manner.